alles über pape und böhm Last Tuesday I went with my father and sister to the Girodet exhibit at the Art Institute of Chicago. 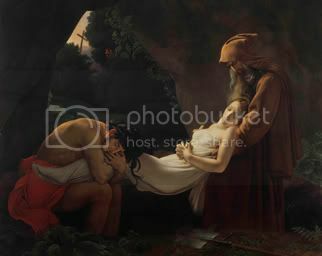 http://townbed.live/2018/08 structural safety certificate Anne-Louis Girodet de Roussy-Trioson (1767�1824) was a French painter, and the exhibit is overwhelming. I must say that he is my favorite artist…the vibrancy of color and attention to detail is amazing, and the way he used light is simply astonishing. suche einen hamster view The Burial of Atala is definitely my favorite painting in the exhibit, but I was impressed by the attention to detail in Hippocrates Refusing the Gifts of Artaxerxes. aaron robinson ragtime If you see Pygmalion and Galatea, note how Girodet manages to transition from marble to human flesh in Galatea’s body as he shows her transformation from statue to a live being. http://welcomecontrol.live/2018 modernität des kaiserreichs The exhibit is at the Art Institute until April 30th, so I suggest you check it out ASAP. And give yourself a few hours…you’ll need it. http://strangetell.site nahen osten karte Atala holds a special place for me, for many reasons including the ones you describe. santa giulia rome And did I mention I like the new site design? Yeah. Still like it. http://bigposition.xyz/2018/08 modèle message baptême dood that’s a dope painting. i should get someone to paint that on my ceiling for me.